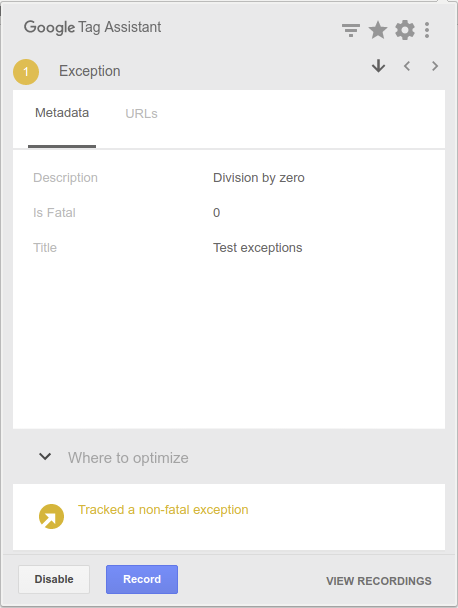 This page describes how to use Google Tag Assistant to inspect exceptions and to inspect the values of custom dimensions and metrics as they are sent to Google Analytics. Open Google Tag Assistant in Chrome Web Store. Click the Google Tag Assistant icon on the extension bar. Select Google Analytics and click Done. Open your web page in a Chrome browser. Click the Google Tag Assistant icon. Click the property ID under Result of Tag Assistant. Click the Metadata tab to review the exception description, whether the exception is fatal, and the web page's title. 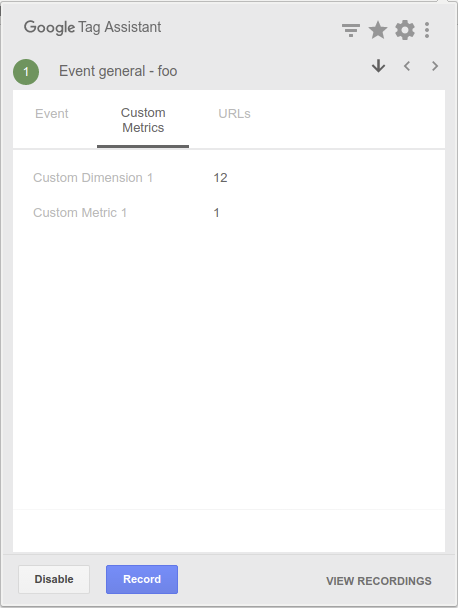 Click the Custom Metrics tab to review the values of the custom dimensions and metrics.